The winner of “Arab Idol,” Mohammed Assaf is planning to move from the Gaza Strip to the West bank. The 23-year-old singer hopes the move will allow him to develop his musical career. Israel’s coordinator of government activities in the occupied territories, Major-General Eitan Dangot, approved Assaf’s request to move, on Monday. Assaf will be joined by his parents, sister and brother-in-law, who is also the young star’s manager. The ambitious young singer realized he would not be able to pursue his career if he remained in the Hamas-ruled Khan Younis refugee camp in the southern Gaza Strip. 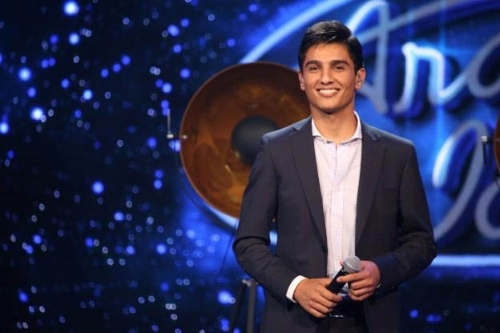 Assaf, born in Libya to Palestinian parents was barely able to compete in the Arab Idol singing completion. According to Israeli newspaper Yedioth Ahranoth, Assaf had to implore Hamas to let him leave Gaza and then bribe Egyptian boarder guards in order to attend the auditions in Cairo. The “Arab Idol” contest itself was broadcast from Beirut. Throughout the past month and a half the “Arab Idol,” champion has toured though different Arab countries to sing. Assaf otherwise resides in the West Bank, however his family is still in the Gaza Strip where he cannot see them. With the move having been approved, Assaf will be reunited with his family and be able to continue developing his musical career in the West Bank. Palestinian police investigations revealed that the killer of his brother's family, who is known locally as Salfit butcher, was working as a spy for the Israeli intelligence. Last month, a brutal murder of a young pregnant housewife named Lina Fattouni and her kids Majd and Jana rocked Salfit city. The police investigations found out that the killer, Abdul-Muneim Fattouni, murdered his sister-in-law (Lina) and her kids by direct strangulation and used the gas cylinder in the house to cover his crime and make others believe that the victims died of gas suffocation. The police affirmed that the real reason for the murder was that his sister-in-law had discovered that he was working for the Israeli intelligence, so he hastened to get rid of her at the instigation of his Israeli employer. The killer noted in his confession that his Israeli intelligence employer had advised him how to cover his tracks after committing his crime by making up a gas leak in the house, carrying the body of the little girl and using her hand to wipe out any of his fingerprints to be found on the doors and the gas cylinder. On Sunday the New York Times published a biased article focusing on the 'culture of stone-throwing' in the West Bank’s small farming town of Beit Ommar, just north of Hebron. The author, Jodi Rudoren, traveled to the Beit Ommar to get to the bottom of stone-throwing, which she refers to as ‘a Palestinian hobby’. 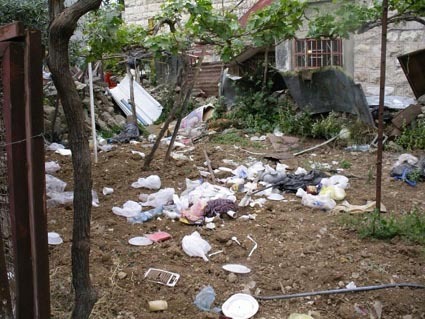 Rudoren brushes over the context: Beit Ommar has been occupied by Israeli settlers and military for decades. Generations of Palestinians in Beit Ommar have never known life without the constant violence, humiliation, and dehumanization of the Israeli Occupation Force (IOF). A third of their land is illegally occupied by settlers, who receive incentives from the Israeli government to live there. Instead of investigating small rocks thrown by youth in relation to the occupation, Rudoren portrays stone-throwing as a deadly hobby of Palestinian youth, which victimizes the innocent Israeli settlers and the helpless IOF officers. Don’t mind that the military officers drive tanks and wield rifles at all times. Rifles, that they shoot at children to counter the rocks they throw. Tanks that they use to transport children as young as 9 years old into prison, in the middle of the night, where they are kept for up to eleven months, which strategically also keeps them out of school. Don’t mind the UN report that the IOF has arrested 7,000 minors between 2002 and 2012 for the terrible crime of throwing rocks. Don’t mind that Defense for Children International, an advocacy group, found that of the Palestinian youths arrested last year, most were blindfolded, beaten and threatened during interrogations until they confessed to throwing stones. Rudoren meets a local settler near Beit Ommar, who explains the injustice of the situation. “It’s crazy: I’m going to get pizza, and [it’s as if] I’m driving through a war zone.” News flash lady: Occupation is a war tactic and you are on the offence. Later, settlers were ‘forced’ to shoot Palestinians on that very same road. Sounds like the settlers really are getting the short end of the stick. “They throw because there is little else to do in Beit Ommar — no pool or cinema, no music lessons after school, no part-time jobs other than peddling produce along the road. They do it because their brothers and fathers did.” Rudoren got to the bottom of the strange mystery of rock throwing! 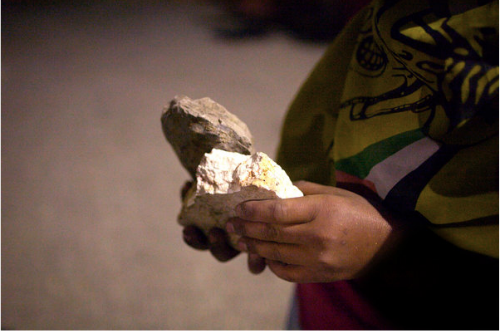 Palestinian youth throw rocks because they are impoverished, animalistic, violent, and to top it all off, bored! Foreign Minister Riyad al-Maliki met Monday with Iran’s vice president Issac Jahangiri in Tehran and delivered congratulations on behalf of President Mahmoud Abbas to the newly sworn-in president of Iran Hassan Rohani. According to the official Palestinian news agency Wafa, al-Maliki told the Iranian official that Abbas was looking forward to developing relations between Palestine and Iran and making relations more open so as to serve interests of both nations. The foreign minister updated the Iranian official on the ongoing Israeli violations in Palestine, particularly in Jerusalem and its holy al-Aqsa Mosque. He explained that Israeli extremists had set fire to mosques and houses as settlement expansion continued across the West Bank including Jerusalem. For his part, the Iranian vice president thanked Palestine for joining the inauguration of Iran’s president-elect. He reiterated that Iran would continue to support the Palestinian people and Abbas’ efforts to end rivalry between Fatah and Hamas. Deputy head of Hamas's political bureau Mousa Abu Marzouk said that the decision taken by de facto president Mahmoud Abbas to resume the peace talks with the Israeli occupation put the national reconciliation file in a refrigerator. In remarks published on Monday by Quds Press, Abu Marzouk added that the internal events in Egypt made it unready to host inter-Palestinian reconciliation meetings. The Hamas official also belittled the threats made by Abbas to issue a decree setting a date for the presidential and legislative elections in the occupied Palestinian lands without the consent of Hamas at the pretext that it obstructs the execution of the reconciliation agreements. Youm7, or the seventh day, quoted Egyptian diplomatic sources as saying that Tayyip Erdogan's visit to the Gaza Strip had been canceled following the military ouster of Islamist President Mohamed Mursi and subsequent change in government. 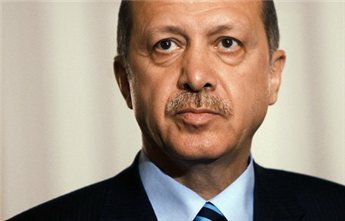 The Gaza trip was also canceled because of Erdogan's support for the Muslim Brotherhood, Youm7 reported. A senior official in the ruling Hamas movement said in June that Erdogan was due to visit the coastal territory in July, but the Turkish leader's press secretary had stressed that the date was still undecided. The Turkish leader has previously said his visit to Gaza would be aimed at pushing for an end to Israel's blockade on the tiny coastal territory which has been in place since 2006. Egypt's state prosecutor said last week that ousted President Mohamed Mursi was detained for questioning over suspected collaboration with Hamas in attacks on police stations and prison breaks in early 2011. Hamas condemned the move, saying it was "based on the premise that the Hamas movement is hostile," spokesman Sami Abu Zuhri told AFP in response. "This is a dangerous development, which confirms that the current powers in Egypt are giving up on national causes and even using these issues to deal with other parties -- first among them the Palestinian cause." Omar Shaban, specialist in economic affairs, warned of the continuation of the closure and demolition of tunnels that supplies the besieged Gaza Strip with basic necessities of life, by Egyptian authorities. 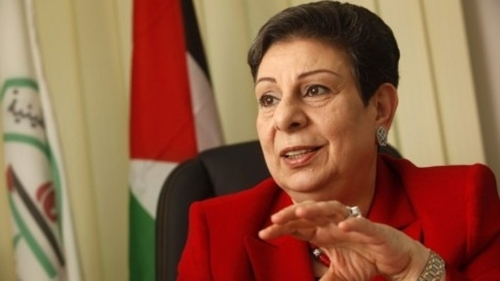 Shaaban urged the Palestinian government to form a "crisis cell" of at least 80 people representative of the Palestinian political spectrum and international institutions to overcome this crisis. This came during a workshop held by the General Administration of sectorial coordination of the Ministry of Planning, in the presence of Minister of Planning Dr Ala Rafati Din, a number of human rights activists, ministers, MPs and leaders of the private sector and institutions. For his part, Dr. Adnan Abu Amer talked about Gaza's relationship with Israel in light of the coup in Egypt, pointing out that the Israeli state has welcomed the coup. Abu Amer expected that the occupation would wage a new aggression on the Gaza Strip taking advantage of the world's preoccupation with the Egyptian file. The attendees also condemned the campaign against the Gaza Strip launched by the Egyptian media with the participation of the some media in the West Bank. A Palestinian researcher and activist in London said that the Palestinian resistance represents the Ummah’s spearhead in confronting Israeli occupation on the land of Palestine. Majed Al-Zeer, head of the Palestinian Return Centre in London, stressed on his Facebook page that the Palestinian resistance represents "the first line of defense, which defends all Arab and Islamic countries, mainly the neighboring countries including Egypt. 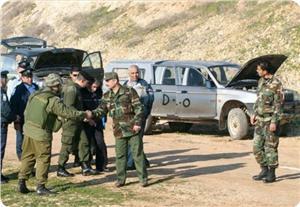 It is an integral part of the defense of the Egyptian national security." 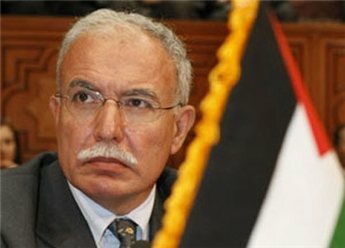 Zeer's comments come after the easing of the media campaign launched by some Egyptian media against the resistance and the Gaza Strip, after Hamas revealed a number of documents that confirm the involvement of leaders of PA and Fatah movement in the campaign of incitement against Gaza. Hamas spokesman Samir Abu Zuhri said the latest remarks made by senior member of the Egyptian movement Tamarud, Mahmoud Al-Arabi, proved that Hamas does not interfere in Egyptian's internal affairs. Arabi stated on Thursday during a massive rally outside Ibrahim mosque in Alexandria that director of the investigation bureau Naser Al-Abed in the city prepared a gang of thugs, provided them with Al-Qassam Brigades uniforms and distributed pictures of them as Hamas resistance fighters. Spokesman Abu Zuhri said, in a press release, that Arabi's remarks cleared Hamas of its alleged involvement in events in Egypt. He called on the Egyptian authorities to investigate this incident, take legal action in this regard and end the systematic incitement campaign against Hamas. 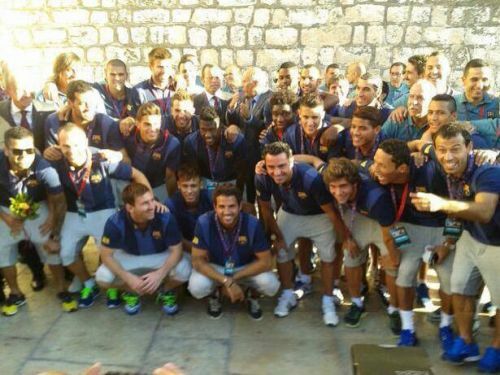 [Saturday Evening August 3, 2013] Palestinian President, Mahmoud Abbas, welcomed at his Presidential Headquarters in the West Bank City of Bethlehem, the players and coach of Barcelona soccer team, who are conducting their first visit to occupied Palestine. “This is your first visit to Palestine, but you are always in Palestine, in our homes, our people love you and watch your games”, Abbas said, “You visited the Church of Nativity, and I hope you enjoyed your time in the land of prophets, especially Jesus Christ”. “We know you carry another message besides sports, you carry a message of peace”, the President said, “We are holding direct peace talks, and we know you also want peace and stability”. Abbas also told the Barcelona athletes that next time they visit Palestine; they will visit it to celebrate comprehensive peace. Head of Barcelona club president, Sandro Rossell, stated that the team’s visit to Bethlehem is very important, as the city is the birthplace of Jesus Christ, and represents peace on earth. Rossell thanked the Palestinian People, and President Abbas, for the warm welcome and added that the team is honored by this visit, and honored by being personally welcomed by President Abbas. “The timing of this visit is essential, it comes with the beginning of direct peace talks in Washington”, he said, “We hope peace will be achieved, we wish all the children we saw in Bethlehem, and everywhere, will live in peace, because they have hope for the future, if by being in the country Barcelona can help achieve peace, we will always be there”. It is worth mentioning that various officials, religious leaders, figures representing local NGOs, Palestinian Sports Minister, Jibreel Rajoub, and Palestinian Arab Idol, Mohammad Assaf, also welcome Barca team in Bethlehem. Rajoub, also the head of the Palestinian Soccer Union, and Rossel, stated that this visit is historical and very important to the Palestinian people, adding that this step is a positive step towards comprehensive peace in the region. During a press conference with Rossel, Rajoub said that Barca is conducting a “tour of peace, a positive step towards peace in the region”, and added that “one day, all teams, all nations in the region, will play together once the Palestinian State has been established. Barcelona team also visited the new stadium in the town of Doura, near the southern West Bank city of Hebron, and was welcomed by more than 25.0000 Palestinian fans, many of them wearing Barcelona shirts. Members of the team also held an hour-long clinic with more than 40 young Palestinian girls and boys, Yahoo Sports has reported. 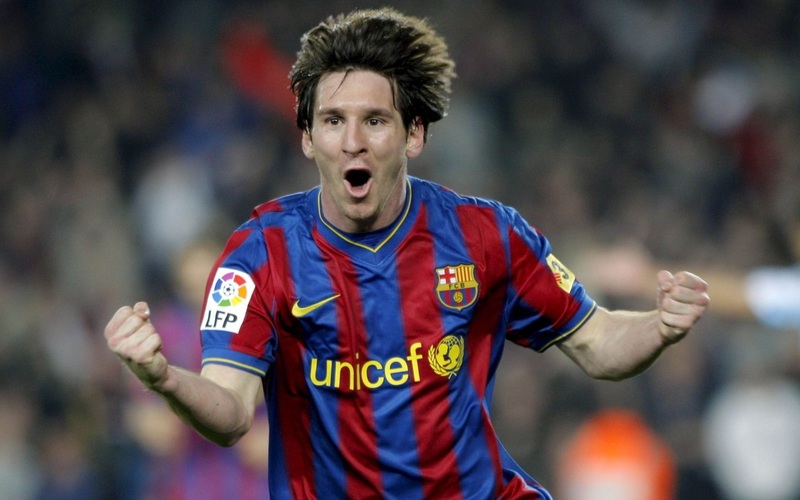 Lionel Messi, the world's number one football player, and his Barcelona teammates are expected Saturday afternoon in Palestine in their first visit ever to the area. 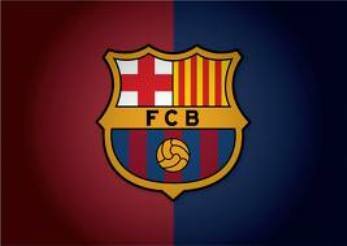 The Barcelona team is one of the most favored international football clubs in Palestine with loyal fans estimated it the tens of thousands. The Palestinian dailies dedicated several pages in their Saturday issue to talk about this highly important event, the Catalonian club and its “Peace Tour” in the region, which would also take it to Israel after concluding its Palestine visit. But while in Palestine, the Palestinian fans are going to enjoy one of the most important moments in their lives: watch the Barcelona team on one of their football fields. The team is expected to arrive in Bethlehem at 5:00 in the afternoon. It will first visit the historic Church of Nativity, the birthplace of Jesus Christ, before meeting with President Mahmoud Abbas at his Bethlehem headquarters. It will then go to the Dura football stadium in the Hebron area where its fans are going to be waiting to see the players live in the field.The team is going to do some workout with around 30 Palestinian children, but no real game is scheduled, which for many was a letdown because they will not be able to watch the masters in action. But before the team arrives at the stadium, Arab Idol winner Muhammad Assaf will entertain the crowds with some of songs they have heard him sing during the Arab Idol contest. Walid is returning to visit his family in Gaza after an absence of 38 years. The “lady” — Dana — is an Israeli actress who is heading home, having failed to convince her Ukrainian-Jewish boyfriend to take Israeli citizenship and live with her. But despite the apparent centrality of this episode to the novel’s identity, it is in some ways the least engaging and interesting part of the book. Much more affecting and convincing, in many ways, is the overall narrative, of which this airborne encounter is just a brief part. For it slots into a longer story, that of Walid the exile who has led the archetypal life of a diaspora Palestinian, moving from country to country and job to job, surviving on his wits and contacts. Verve The novel uses the account of this return journey as a framing device for his life story, told with a perceptive wit and verve which raises the novel well above the average mock-biographical narrative. Haunting Al-Madhoun’s bitter wit and scathing remarks also help to provide some wry laughs and ensure that the novel is in no danger of touting for any one political position. Palestinian leaders are compared to the puffed-up cockerels crowing in Jabaliya refugee camp, while a cousin of Walid’s who has become a sheikh and speaks in classical Arabic to give himself gravitas is mercilessly mocked in a virtuoso piece of translation by Elliott Colla. Visceral Madhoun’s depiction of the loving, claustrophobic, violent, beautiful, steadfast, endangered place that is Gaza is enthralling. There is a visceral veracity to the cramped juxtaposition of Walid hearing about the martyrdom in the second intifada of 14 relatives with his recollections of moments of forbidden lust. 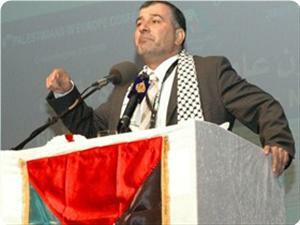 Did Fatah spread "black lies" against Hamas in Egypt? The documents which seemed fairly bona fide and underwent no doctoring whatsoever, showed that Fatah's intelligence elements transferred deliberately concocted intelligence information, alleging that Hamas was smuggling weapons and bombs into Egypt for the purpose of destabilizing the country and undermining its security. Earlier, Fatah disseminated false information claiming that Hamas was involved in terrorist attacks carried out by al-Qaeda gunmen against Egyptian police targets in the Sinai Peninsula. 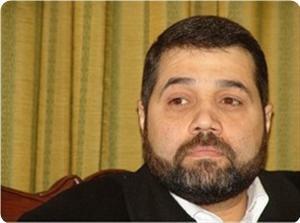 Hamas argues seemingly sincerely it has no interest whatsoever in undermining relations with Egypt. With the more or less hermetic Israeli siege, Egypt serves as the Gaza Strip's only "lung" to the outside world. Fatah also pumped out disinformation to the notoriously mendacious Egyptian media claiming that the deposed democratically-elected President, Dr. Muhammed Mursi, had been negotiating with Hamas the establishment of an Islamist Emirate in Sinai. These and similar obscene lies were readily received by the vehemently anti-Islamist media in Egypt, especially those funded by Coptic Tycoon Najib Swaris and Arabian Intelligence agencies. Even Egyptian state-run media outlets, such as Sawt el-Arab (the Voice of the Arabs and Al-Ahram newspaper) parroted these brash lies without patting an eyelash. Which really shows the low level that most Egyptian media outlets have stooped to especially in the past few months. There is no doubt that Fatah, or certain elements within the Palestinian national secular movement, is rabidly interested in tarnishing the image of Hamas, its political and ideological archrival, by hook or by crook. Fatah, especially since Hamas wrested control over the Gaza Strip following democratic elections in 2006, has been trying rather rabidly to demonize and vilify Hamas, often using virulent canards and black lies. Unfortunately, some of this black propaganda, was further disseminated by Israeli and Western media without any modicum of ascertainment. For example, it was repeatedly claimed in 2007-8 that Hamas militiamen were throwing opponents off the rooftops of multi-story buildings in Gaza. Fortunately, this big lie was eventually refuted and debunked, but not after it inflected the intended damage. (By the way the pornographically mendacious Egyptian media has been indulging in similar lies about the Muslim Brothers and President Mursi supporters). Reacting to Hamas's latest revelations, Fatah and Palestinian Authority denied that they were involved in this treasonous disgrace, claiming that Hamas was lying and trying to vilify Fatah. However, Fatah's defensive reflexes seemed to conceal a certain proclivity to incite the undemocratic military authorities in Cairo against Palestinian Islamists. Eventually, this propensity evolved into vociferous street demonstrations by Fatah supporters in solidarity with Egypt’s bloody coup. To Fatah's chagrin, the anti-Hamas incitement swiftly morphed into a rabid and sweeping anti-Palestinian hysteria as Egyptian media outlets began calling for murdering Palestinians in Egypt. One typical TV commentator remarked that "Palestinians are our enemies and ought to be killed in the streets like stray dogs." His virulent remarks, many pundits say, represented the norm not the exception. 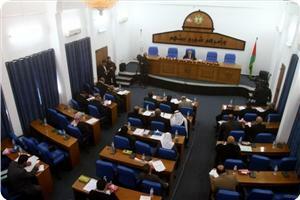 Fatah's embassy in Cairo reportedly said it was willing to launch an investigation into the charges. This should be a positive step, at least ostensibly. However, the PA office in the Egyptian capital can't really launch a real, credible inquiry into the latest scam since intelligence officers at the embassy are not answerable to the ambassador but report directly to the Ramallah, often without the knowledge of the embassy's officials. The anti-Palestinian incitement permeating through the Egyptian media is undoubtedly a disgraceful behavior, marking the nadir of that media. But what can we expect from a media apparatus that lies as often as it breathes? By the way, this sorry state of affair didn't start yesterday or the day before. The bulk of the Egyptian media has always been notoriously, even pornographically mendacious. Just remember Ahmed Said who told us on the fifth of June, 1967, that the Egyptian army was overrunning Tel Aviv and that Israeli warplanes were falling down like flies!!! We know the rest of the story. It is imperative that the government in Ramallah carry out a credible investigation into this affair. This is extremely important in order to allow our people to know the truth. We certainly don't want to build a Palestinian state on a foundation of lies. In all countries that respect themselves, Civil servants and public figures who are proven to have committed a perjury are punished and made to bear an indelible stigma for the rest of lives. This also should be the case in occupied Palestine, otherwise our contemplated state would be just another failed state. Lying is probably the next most hideous crime after murder. Nearly all crimes, including treason, corruption, etc, begin with lying. This is why the Prophet Muhammed ( S) stressed that a Muslim can't be a liar since faith and lying can not coexist in a believer's heart. Had Egypt and other Arab countries punished liars from the very inception of their modern independence, they wouldn't have reached the sorry state of affair they are now facing. In 1952, when King Farouk was deposed, Egypt was at the same socio-economic level of countries such as South Korea and China . Now, South Korea and India are economic superpowers while Egypt is effectively a failed state, begging handouts from everywhere. The reason is clear, the Egyptian political establishment, ever since Gamal Abdul Nasser, adopted lying and falsification of facts as its modus operandi. Eventually, this impotent and incompetent establishment enabled a little army general, who can hardly read a correct Arabic sentence to overthrow a democratically-elected President who has a Ph.D. in Engineering from the University of Southern California. Hence, one is prompted to ask the following question: Should we Palestinians follow the example of Egypt or South Korea. I think the answer very much depends on our willingness to tolerate lies and lying…because lying corrodes societies and prevents progress and development. Egyptian security sources and eyewitnesses said that the Egyptian army captured a man called Sheikh Fathi al-Falastini, in the Safa neighbourhood of the Egyptian Rafah city. He is a PA preventive security officer. Al-Sharq al-Awsat news agency said that officer grew a beard and lived amongst the people in Safa neighbourhood and became known as Sheikh Fathi, an Islamic propagator. When the army searched his house, they found documents which they described as dangerous, as well as plans for a number of elements and mercenaries in Rafah and Sheikh Zweid. 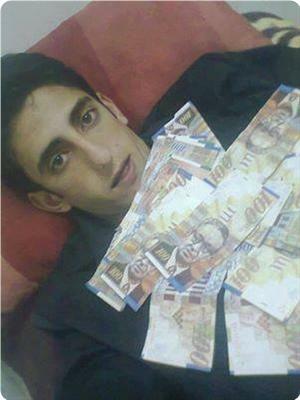 They also found pictures of Safa and Ahrash army camps as well as sums of cash. The sources said that armed men fired at the army camp, the soldiers exchanged fire with them and arrested a man called Fathi A.K., a Palestinian who lives in Rafah. About 200 security officers loyal to Muhmmad Dahlan fled the Gaza Strip into the Sinai in 2006 when Hamas took over in the Strip. The PA in Ramallah arranged for their stay with the Egyptian authorities and still pays them their salaries through the Palestinian Embassy in Egypt. "I Will Keep Trying to See My Daughter Until the Day I Die"
Fatma's wrinkled face reveals the sorrow of a mother who has not seen her daughter for eleven years. Fatma Khalil Mubarak (78) lives in Rafah, in the south of the Gaza Strip. Her daughter, Lamees Ahmad Mubarak (44), has been living in Hebron in the West Bank since she got married in 1988. The last time Fatma saw her daughter was in 2002. Since then, Lamees has been trying to visit her family in Gaza, but she has been denied access every time she applied for a visitor permit to travel via Beit Hanoun ("Erez") crossing. Beit Hanoun crossing is the only access point for people from Gaza to travel to the West Bank, including East Jerusalem, and/or Israel. Fatma explains: "My daughter Lamees went to Hebron with her husband when she got married in the '80s. She used to visit me frequently, and I used to visit her as my health condition was much better and crossing to the West Bank was much easier. However, since the Second Intifada, we haven't seen much of her. The last time she came was in 2002, but she has never been able to come back again since." Several attempts have been made by both Lamees and her family to reunite since 2002; however, Lamees' applications for a visitor permit to the Gaza Strip have always been met with refusal. "This year, we have applied twice so far, but in vain. The permit was refused again. We have not given up yet. I will keep applying for a permit to see my daughter until the day I die." Fatma's urge to see her daughter gets stronger every day, especially due to her deteriorating medical condition as she suffers from heart disease and hepatitis. "I do not know why I'm deprived of seeing my daughter," she adds. "She is my daughter and she only wants to come and visit me as I am very ill. Why is she always refused entry? She is not a threat to their security. She only wants to come so I can see her." "We have tried everything. The last time we applied, we attached a copy of my medical report certified by the doctors to attest to how poor my condition is, but even that did not work. The Israeli authorities refused to give her a permit again. We all thought that it would work and that she would finally manage to come." 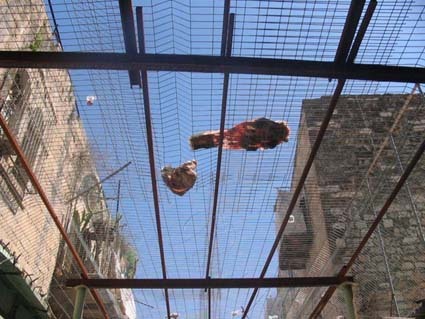 "The last time I went to visit Lamees in Hebron was seventeen years ago. Since I became very ill, it is hard for me to travel on my own. I do not even leave this house. I know that I might get a permit if I applied for one, due to my age and my medical condition, but what would I do with a permit when I cannot move and cannot go anywhere alone? My health condition does not allow me to. What if I died on the way? The Israeli authorities won't allow my children to accompany me to the West Bank." 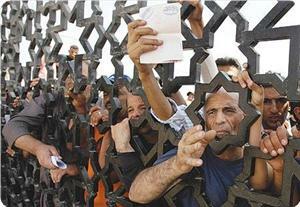 Israel imposes a policy of territorial fragmentation on the West Bank and the Gaza Strip. The separation of the territories has had grave consequences on the fabric of society. 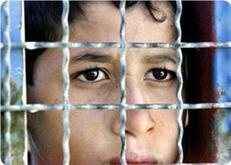 It has influenced every aspect of the social life of Palestinian people. Fatma explains how the Israeli closure of the Gaza Strip has further prevented her and her family from fulfilling her role as a mother and a grandmother. "Lamees got very sick recently. I could not go to visit her or look after her. None of her family could either. She is there on her own. Her father became very ill before he died in 2008. He wanted to see her, so we applied for a visitor permit, but the permit was refused. He died without seeing her, and she could not attend his funeral. Now, I have seven grandchildren whom I do not know. Two of my granddaughters got married, and I could not attend either of their weddings." The separation of the Gaza Strip and the West Bank has made the simplest family occasions very difficult. According to Fatma, Lamees was hoping to attend the wedding of her nephew in Gaza, which was planned for after Ramadan, in order to celebrate the happy occasion with her family. "We were getting ready to receive her at the wedding and we were expecting her. We were disappointed to hear that her permit had been refused again. No matter how many times she is denied permission to come, I am always hopeful that she will get the permit the next time and that I will see my daughter again. I cannot get used to the refusals. I will keep asking for permits again and again." Fatma recalls the days when Israeli restrictions on the movement of individual civilians via Beit Hanoun crossing were less strict: "In the past, when I applied for a permit, I would get it the next day. I would take a taxi from Gaza City to Hebron. We used to leave for Hebron in the morning and arrive before noon. It was only about an hour's drive. Nowadays, it's easier for me to see my daughter who lives in Norway than see my daughter who lives an hour away." Palestinians in the Gaza Strip remain denied of their right to freedom of movement, and suffer greatly due to the restraints imposed upon travel via Beit Hanoun crossing. The restrictions were first imposed in 1994 and have become increasingly strict since the al-Aqsa Intifada. Eventually, the crossing was completely closed on 16 February 2006. Since then, Palestinians have been prevented from travelling via the crossing unless they fall under certain specific categories. As a result, civilians in the Gaza Strip have been denied access to holy places in Jerusalem and Bethlehem to perform religious rituals. Students have been prevented from travelling to attend universities in the West Bank. Families are prevented from visiting their relatives in the West Bank and vice versa. Since the Hamas takeover in June 2007, the Israeli authorities have only permitted limited categories of individuals to travel via the crossing: patients in a critical state; international journalists; employees of international organisations;. These groups are allowed to travel via the crossing under limited circumstances, via complicated procedures, and are often subjected to degrading treatment. The closure of the Gaza Strip, which Israel has imposed for six consecutive years, constitutes a form of collective punishment, in violation of international humanitarian law. As a consequence of the continued closure, travelling between the Gaza Strip and the West Bank has been rendered virtually impossible for Palestinians, and entire families are now separated. 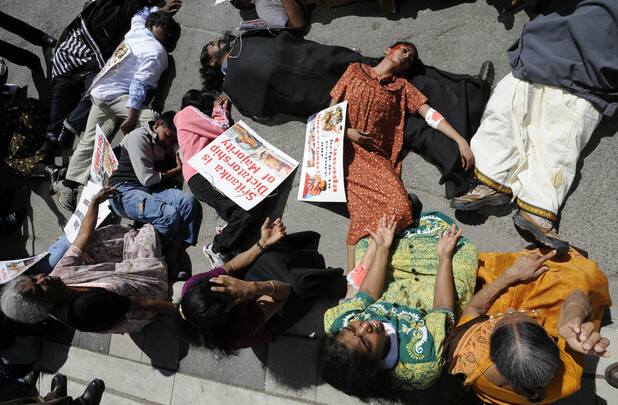 The forced separation of families is in violation, inter alia, of Article 16 of the 1948 Universal Declaration of Human Rights (UDHR) and Article 23 of the 1966 International Covenant on Civil and Political Rights (ICCPR) which obliges States to protect the right to marry and found a family. Dr. Salam Fayyad, Former Prime Minister of Palestine will receive the 2013 HCEF Path of Peace Award on Friday, October 18, 2013 at the HCEF Awards Banquet, held in conjunction with the 15th International Conference, Friday and Saturday, October 18-19, 2013, Holy Land Christian Ecumenical Foundation (HCEF) said in a press statement Wednesday. The HCEF Path of Peace Award has been established to honor an individual who throughout his/her life has vigorously championed the cause of Peace in the Middle East. HCEF also said that Fayyad's service and work as Prime Minister of Palestine has significantly advanced the Palestinian cause. His effort in strengthening and building the infrastructure of Palestine, especially during the many obstacles and challenges Palestine faced during his term as Prime Minister are outstanding! Sir Rateb Rabie, KCHS, HCEF President and CEO expressed his sentiments with these words, "Truly, Prime Minister Fayyad's contributions have changed the world's perspective of Palestine and boosted the spirit of all Palestinians by building the infrastructure of the future state under occupation!" Prime Minister Fayyad's support of the HCEF Know Thy Heritage (KTH) Live & Visit Palestine Program has been inspiring. Through the KTH program, youth in Diaspora travelled to Palestine where they met with HE Fayyad and learned to be Ambassadors of Peace, by following in his footsteps. HCEF applauds and honors the tireless efforts of Minister Fayyad, a true visionary, in facilitating peace and building Palestine. 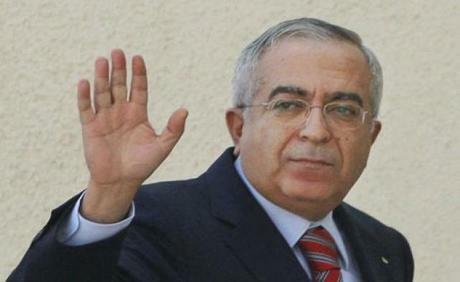 According to HCEF, the Path of Peace Award is conferred on Fayyad in recognition of his work, his dedication, and the remarkable contributions he has made in establishing a dialogue of peace and reconciliation through his visionary leadership and career. This same evening, Eminence Donald Cardinal Wuerl, Archbishop of Washington will receive the Holy Land Christian Ecumenical Foundation Award; Mr. Said Khoury, Co-Founder and Chairman, Consolidated Contractors Companywill receive the Palestinian Diaspora Award and the HCEF President Awardees are Mrs. Jamilah Aranky, HCEF Representative in Birzeitand Mrs. Mary Ann Flannery, HCEF Volunteer. The Awards Banquet and the 15th International Conference will be held Friday, October 18 - Saturday, October 19, 2013 at the Washington Marriott, 1221 22nd Avenue, NW, Washington, DC 20037. The two documents allegedly written by Fatah, that describe a plot against the Hamas party, were dismissed today as fabrications by members of Fatah’s revolutionary council. On Tuesday, Hamas members attended a conference concerning the documents that they allege were sent by Fatah to the media and security attachés at the Palestinian embassy in Cairo. 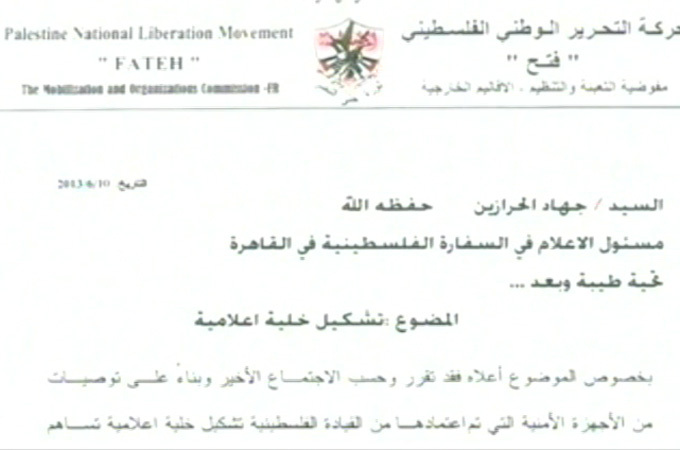 The two documents were allegedly sent by Fatah to the media and security attachés at the Palestinian embassy in Cairo. According to Al-Jazeera the documents called for “[the] fabrication of news that would embarrass Hamas,” as well as efforts to link Hamas to the recent violence in Egypt. 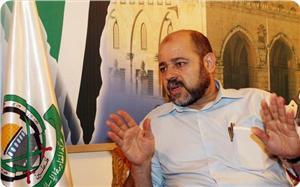 Hamas official Salah al-Baredweel said that the documents "urge hatred, not only against Gaza or Hamas, but against the Palestinian people". 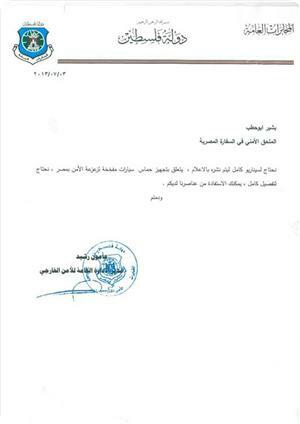 The documents however, were dismissed today as being fake by the Fatah Revolutionary Council and it was proved that the letterhead of the documents did not correspond to the official Fatah letterhead. 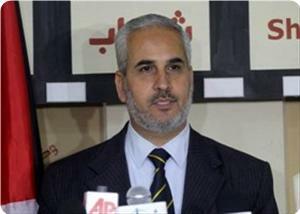 Fatah member Muwafak Matar commented on the falsifications: "We believe that Hamas is taking a new political course at this moment. 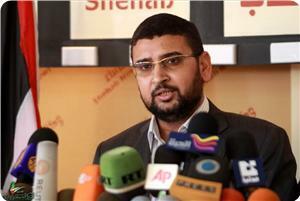 Hamas wishes to steer away from the reconciliation among the Palestinians," according to Al-Jazeera. The relationship between Fatah and Hamas has been chilly since 2006 when the legislative victory for Hamas resulted in a political split between the Hamas ruled Gaza strip and the Fatah ruled West Bank. The current political situation in Egypt has constituted a further challenge to the relationship between Hamas and Fatah since the interim government of Egypt accuses Hamas of having political ties to the recently overthrown Muslim Brotherhood. 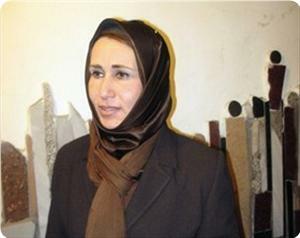 MP Najat Abu Baker, affiliated with the Fatah movement, stated that ending the division and achieving the national construction is more important than negotiation option. MP Baker told Quds Press that the Israeli-Palestinian negotiations had never been stopped, pointing out that the PA came as a result of negotiations which were scheduled to lead to a state with full sovereignty, but Israel repudiated the agreement. 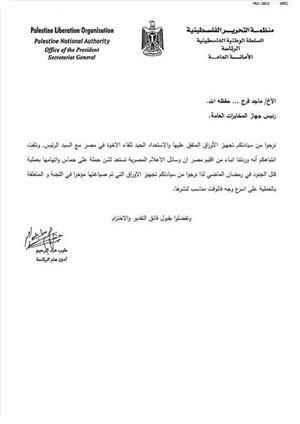 The MP for Fatah movement stated that the majority of Fatah members is in support of Abbas' decision to resume talks with the occupation especially after the Israeli vow to release a number of prisoners and the international parties' keenness to achieve the talks success for fear of prosecuting the occupation in the international courts. It was better to resume talks after achieving the national unity, she said, pointing out that ending the division is more important than resuming talks and meetings with the occupation authorities. Anger co-exists with a sense of beauty in a valuable journal of West Bank life. Raja Shehadeh is an angry man. He is angry about the Israeli occupation of the West Bank, the illegal settlements that dot his beloved Palestinian landscape and the roads that divide the people of this territory. And he is angry about the failure of Israel's allies and donors to prevent the discrimination against Palestinians and Israeli Arabs that he encounters in his life as an activist and a lawyer. Shehadeh is also a contemplative man, a walker who meditates, tends his garden and writes about his daily life in Ramallah with great simplicity and beauty. His first memoir, Strangers in the House, was published 10 years ago to warm reviews, but it was Palestinian Walks that drew a wider audience to his work and won the Orwell prize for political writing in 2008. It combined an intimate account of six walks through the Palestinian landscape with a devastating analysis of the politics of land ownership. Shehadeh's anger in that book was modulated through his observations of the natural world. In these diaries, which cover the period 2009-11, the emotions are more immediate and rawer. Shehadeh's anger extends beyond the political domain and into his personal life: he is even angry with the dental assistant who addresses him in Hebrew. "Hearing Hebrew over the telephone aroused insecurity and fear, recalling earlier times when I received calls summoning me for interrogation by the military." Truly, in Ramallah, the personal is political. Shehadeh notes the destructive potential of his anger, knowing that it is easy to dismiss an angry spokesman. At times, though, it seems that he uses it to sustain himself when beauty is not enough: "I want to continue to feel the anger and to rage, rage against the dying of the light." These raw emotions are also linked to the death of his mother, just before these diaries open. 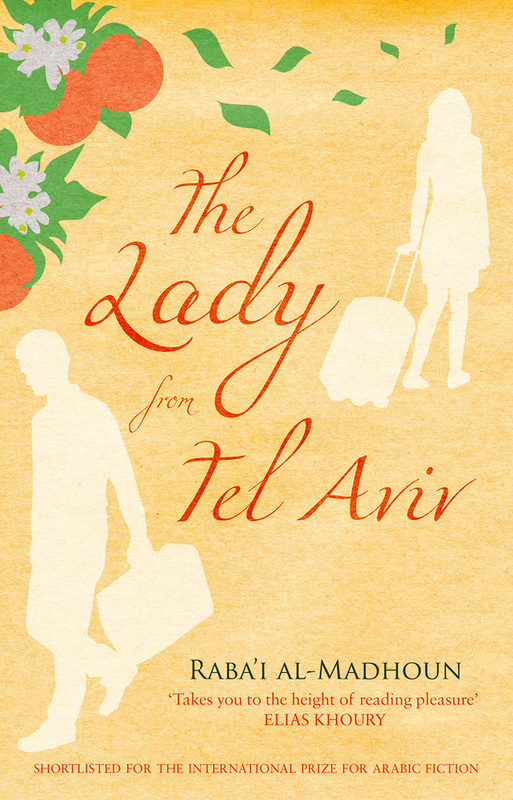 She was exiled from her home city of Jaffa in 1948, and watched her family's wealth disintegrate. In remembering the turbulent 60 years that followed, in which she lost her family, friends and property, he finds himself "still angry at what she had to suffer". This heartfelt rage and frustration oscillates with Shehadeh's continuing sense of beauty, his enjoyment of his garden and his appreciation of "how lovely life is, how dearly we should cherish and cling to it". 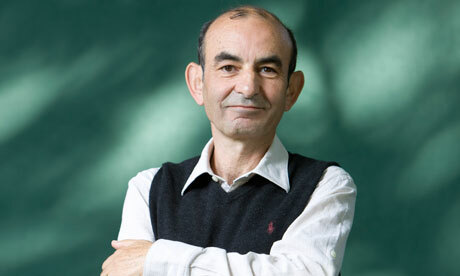 Raja Shehadeh: ‘a contemplative man who writes with great simplicity and beauty’. He watches the Palestinian Authority pursuing a vigorous campaign for full membership of the United Nations. The emblem for this campaign – a gigantic replica of a UN chair – is installed at the centre of Ramallah as a symbol of Palestine's desire for a seat at the table. Shehadeh drives past this with somewhat raised eyebrows. He is almost as sceptical about the Palestinian leaders as he is about their Israeli counterparts. But his spirits are lifted by the Arab Spring and its implications for Israel and Palestine. His diary entries in early 2011 are filled with a sudden rush of exhilaration as the possibility of profound and peaceful change flashes before him. Now the anger is pulled away, like a curtain, to reveal the desperately thwarted hope that lies behind it. Shehadeh dares to imagine a future in which Israel, Palestine and the other eastern Mediterranean states co-exist within a federal structure akin to the European Union. He traces this dream through the shared history of the region, in particular the Ottoman era, during which grand engineering projects linked these territories together by rail. "Not that we should call for a return of anything resembling Ottoman rule – the Ottomans were brutal and inefficient – but, rather, a return to the way things were organised then, with communities and cultures united." This ambitious vision seems increasingly remote as Syria descends into civil war and the deadlock between Israel and the Palestinian Authority shows no sign of relaxing. Yet Shehadeh's rare blend of rage and contemplation gives him the resilience to keep working towards this seemingly impossible dream. He reminds us that France and Germany, mutual enemies for a thousand years, now share a cultural institute in the West Bank. Shehadeh is a committed diarist who has been keeping a journal most of his life and surely his eyes and ears will remain open to these continuing upheavals, just as he continues to watch the dappled light coming through the gazebo covered with vines in his garden. We can only hope that he and his publishers continue to bring us his precious commentary on life inside one of the world's greatest political fault lines. This article was orignially published on The Guardian. Click here to view the original article. Osama Hamdan, a leader in Hamas movement, stated that PA president Mahmoud Abbas leads a serious scheme to drive a wedge between Gaza and Egypt, as part of a systematic policy to take revenge on Hamas movement. Hamdan confirmed that Hamas movement has managed to get official documents to prove PA involvement in a conspiracy in coordination with US and Israel to liquidate the Palestinian cause. Abbas is involved in paving the way for an Israeli aggression against the Gaza strip, the leader in Hamas movement said. Meanwhile, MP Ismail al-Ashqar, who is in charge of the security and interior committee of the PLC, called on Egyptian authorities to exercise caution regarding the fabricated information provided by the PA and Abbas. He pointed out to the false accusations which are fabricated in Ramallah to implicate Hamas movement in Egyptian interior affairs. These fabricated accusations have catastrophic political and security agenda that targets the Palestinian people and resistance through launching an incitement media campaign to demonize the Palestinian resistance, he added. For his part, Ihab Ghussain, the government spokesman, condemned Fatah movement ongoing policy to distort the Palestinian resistance. These attempts to involve our people in the Egyptian internal security events will not affect the historical relationship between the Egyptian and Palestinian peoples, said Ghussain. He stressed that these fabricated stories only serve the occupation and cover the Israeli crimes against Palestinian people. He added that the Palestinian people will prosecute those responsible for these crimes that target the Palestinian people and their interests. Fawzi Barhoum, a Hamas spokesman, denounced PA chief Mahmoud Abbas for championing the destruction of Gaza tunnels and for rejecting a joint trade zone between Gaza and Egypt. Barhoum, in a statement on his Facebook page on Tuesday, said that Israel was not demanding a return to supervising the Rafah border terminal and did not ask for reviving the 2005 agreement that used to regulate the terminal’s work. However, the spokesman noted that Abbas was asking for a return to that agreement that returns Israeli intelligence and European observers to monitor traffic on that crossing between Egypt and Gaza. Barhoum said that the agreement caused suffering among the almost two million Palestinians inhabiting the besieged enclave. Abbas told reporters during a single day visit to Cairo that goods should continue to pour into Gaza via what he called “legitimate crossings”. 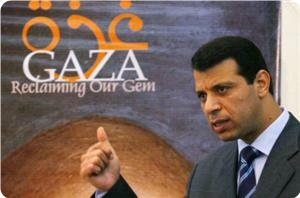 He also called for closure of the tunnels on condition that Gaza populace would not be affected by their closure. Palestinian Legislative Council (PLC) strongly condemned the PA forces' attack on MP Khalida Jarrar after her participation on Sunday in a protest against resumption of talks in Ramallah. 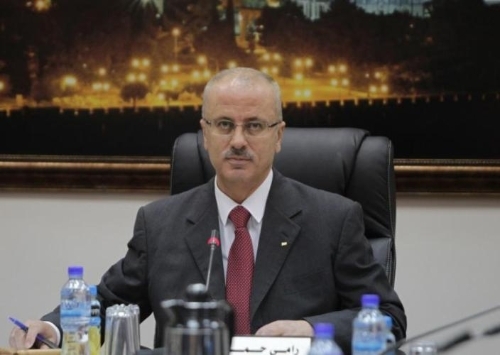 Dr. Ahmed Bahar, PLC First Deputy Chairman, said in a press statement on Monday that PA forces' attack constitutes a serious violation of the parliamentary immunity enjoyed by PLC members. This attack clearly reflects the PA forces and police's disrespect for the constitutional laws, he pointed out. He confirmed that the PA forces' attack on MP Jarar proves the PA's disregard of public and private freedoms in West Bank including freedom of expression. Dr. Bahr called on Palestinian factional and human rights organizations and civil society institutions to condemn and expose PA brutal and arbitrary policy against Palestinian MPs and people. The Popular Front for the Liberation of Palestine (PFLP) strongly condemned PA police and security forces’ suppression to protesters in Ramallah against resumption of talks. PA suppression of peaceful demonstration contrasts with the Palestinian national institutions, including the PLO Central Council and reflects a culture of recklessness, irresponsibility, lack of accountability, and disregard for the law and the national norms of our people, PFLP said in a statement issued on Sunday. 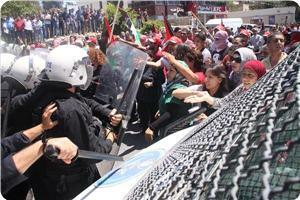 The PFLP demanded to prosecute those responsible for this violence against the peaceful protesters including women. "Sunday protest is the outbreak of a comprehensive popular movement against Oslo accords, the national division, and normalization," the statement added. In a related context, Fatah spokesman Jamal Nazzal waged an incitement campaign against PFLP protest and praised the PA forces' suppression of the demonstrators, threatening to use force to suppress any new demonstration that tries to protest outside the PA headquarters. Meanwhile, PA forces launched an arrest campaign against PFLP members and cadres who were injured during Sunday protest. Khalida Jarrar, member of the PFLP Political Bureau, confirmed that PA forces arrested three members of the PFLP while receiving treatment in Palestine Medical Complex after being injured during PA police's suppression of the protest. MP Jarrar, who was also injured during the march, denounced the PA arrest of protesters suffering fractures and bruises during "PA forces' unjustified attack on the peaceful march." A state of anger and popular discontent has prevailed among the Palestinian people following the PA brutal attack against the peaceful demonstrators including women and MPs. The participants confirmed that PA security forces dressed as civilians have brutally attacked and badly insulted the female protesters, pointing out that many of the injured demonstrators were arrested while in hospitals. Demonstrators chanted against security coordination and normalization and called for accountability for those who have been engaging in meetings with the Israelis and resumption of talks that violates Palestinian red lines. The PFLP has launched previously a mass public campaign to bring down the Oslo agreement, to restore legitimacy to the Palestinian people as the source of resolution and all legitimacy. The Hamas Movement said it obtained documents revealing a plot intended by the Fatah-controlled Palestinian authority (PA) to incite Cairo against the Movement as part of the smear campaign against it. 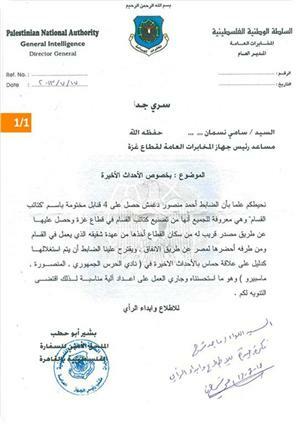 These documents confirm that the PA uses the Egyptian media to fabricate lies and demonize Hamas. The documents unveil that recent preparations have been made by senior PA officials to incite the Egyptian side against Hamas during the coming visit of de facto president Mahmoud Abbas to Cairo and to urge it to accuse Hamas officially of killing Egyptian soldiers in Sinai. Among the documents are two signed letters of correspondence, dated July 24, one between Jihad Harrazin, head of the Fatah propaganda and media office in Cairo, and Attayeb Abdul-Rahim, secretary-general of the PA presidency in Ramallah, and the other between the latter and Majed Faraj, director of the PA intelligence agency. For his part, senior Hamas official Salah Al-Bardawil confirmed that Hamas had access to hundreds of documents exposing the engagement of the PA and Abbas in inciting Cairo against the Movement. "We have obtained many documents probably hundreds, about the fabricated news spread by the Egyptian media which implicate Hamas in the current events in Egypt, and we know the sources of these stories and how they were made up and sent to the Egyptian press," Bardawil told Al-Risala Net. "The biggest surprise was that this smear campaign against Hamas is spearheaded by Mahmoud Abbas himself with the assistance of Attayeb Abdul-Rahim, secretary-general of the presidency, and Majed Faraj, head of the general intelligence apparatus in the West Bank, and they have a hotbed in Cairo run by Jihad Harrazin, including Bashir Abu Hata, Ahmed Mansour Dagmash and PA ambassador Barakat Al-Farra in collaboration with journalists from the Gaza Strip and the West Bank," the Hamas official explained. He stated that the intended visit of Abbas to Cairo is aimed at inciting the Egyptian government into accusing Hamas officially of killing 16 Egyptian soldiers in Sinai.